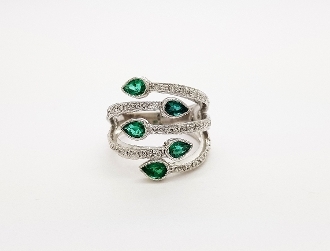 This beautiful emerald and diamond ring speaks for itself with its brilliance and unique design. The bypass style creates a cross over contemporary look which is reminiscent of wild vines. Each emerald is 1/4 of a carat. A perfect ring for anyone who loves one of a kind pieces or anyone born in May who has an emerald birthstone.